Quentin Tarantino at protest against police brutality. 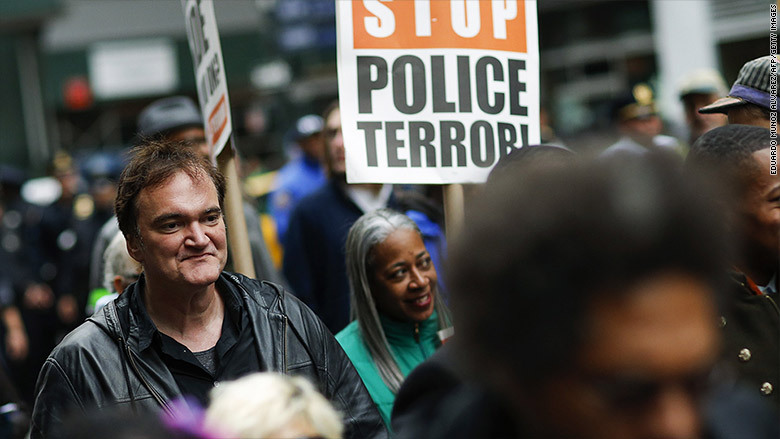 Quentin Tarantino is unfazed by a nationwide law enforcement boycott of his upcoming movie. In an interview with the Los Angeles Times on Tuesday, the Academy Award-winning filmmaker addressed the growing protests, marking his first public response to the controversy over his remarks about police brutality. "I'm not being intimidated," Tarantino told the Times. "Frankly, it feels lousy to have a bunch of police mouthpieces call me a cop hater. I'm not a cop hater. That is a misrepresentation. That is slanderous. That is not how I feel." The controversy erupted last month when Tarantino spoke at a New York City rally after a spate of deadly shootings by police. "When I see murders, I do not stand by," Tarantino said. "I have to call a murder a murder, and I have to call the murderers the murderers." Since then, scores of law enforcement groups throughout the country, including the New York Police Department and the Los Angeles Police Department, have called for a boycott of "The Hateful Eight," the new Tarantino-directed film that's due out on Christmas. Many of the police who are protesting the movie have argued that Tarantino's remarks were especially insensitive because they came days after an NYPD officer was shot and killed in East Harlem. But Tarantino told the Times that he didn't issue a broad indictment of all police. "All cops are not murderers," he said. "I never said that. I never even implied that." He said that the it's "pretty obvious" what the protest is really about. "Instead of dealing with the incidents of police brutality that those people were bringing up, instead of examining the problem of police brutality in this country, better they single me out," Tarantino said. "And their message is very clear. It's to shut me down. It's to discredit me. It is to intimidate me. It is to shut my mouth, and even more important than that, it is to send a message out to any other prominent person that might feel the need to join that side of the argument." "The Hateful Eight" is a Western produced by The Weinstein Co. and starring Samuel L. Jackson and Jennifer Jason Leigh.